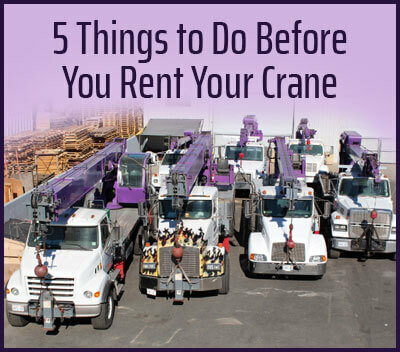 Purple Crane is your best choice when you need a competitively priced, dependable crane and operator to handle a lift in San Diego. We have lifted more than 75,000 loads with our fleet of state-of-the-art cranes, and have an incredible track record for customer satisfaction. In fact, the majority of our business consists primarily of returning and referred clients because they know first-hand that we offer an incredible value. Purple Crane is compliant with all Federal OSHA regulations, and is a proud member of the Specialized Carriers & Rigging Association (SC&RA). We are also fully insured by NationsBuilders Insurance Services, Inc. (NBIS), which is an insurance company that focuses on meeting the specific needs of the construction and transport industry. If you need a crane to assist you with your lift in San Diego next month, next week or tomorrow, call us now at (909) 622-0600. We are standing by 24 hours a day, 7 days a week to assist you. We can often obtain a certificate of insurance in less than a day. 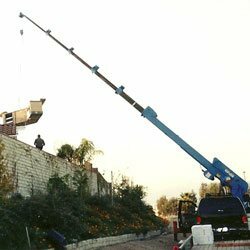 We offer a well-maintained fleet of truck-mounted cranes to San Diego contractors that can handle nearly any lift on almost any terrain. Our crane rental inventory includes hydraulic cranes, hydraulic boom trucks, and light duty boom trucks for lifts as "small" as 3 tons to as large as 75 tons. Our largest crane extends out to 163 feet, which gives us the ability to move objects over homes or place them on top of buildings up to 12 stories high. Our inventory of lift equipment also includes rigging equipment, one-man and two-man man baskets, trucks with trailers, and vans. Our team keeps our equipment in excellent condition by always operating our machines with care and keeping up with regular maintenance. 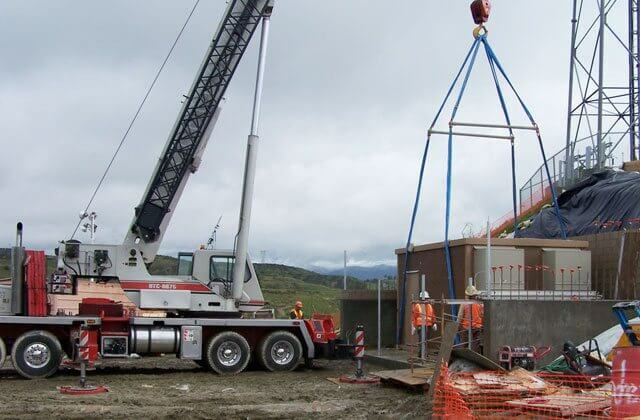 This ensures that all of our cranes are always ready to safely and dependably complete a job on the shortest of notice. 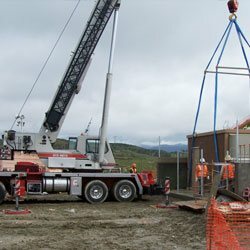 Purple Crane's operators are all CCO-certified (this is a national certification issued by the National Commission for the Certification of Crane Operators) and all have between 9 and 40 years of experience. They use their expertise to determine which crane will best suit your needs in order to complete your job most cost-effectively. Additionally, they will arrive to your jobsite in San Diego at the appointed time, fully prepared and ready to work. 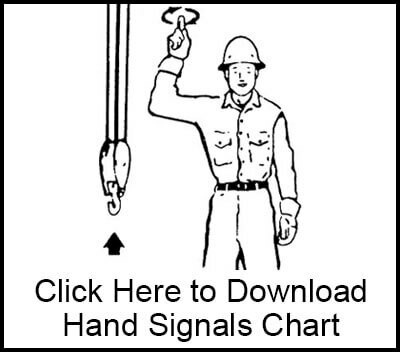 They know how to work with riggers of any industry, which facilitates the communication needed to get a job done safely and efficiently. Purple Crane provides expert heavy- and light-duty lifting services to construction companies in San Diego. Our dedicated team knows how to communicate effectively with riggers in order to efficiently and safely move wood beams, steel beams, trusses, rebar, columns, lumber, cinder blocks, solar panels, roofing materials, concrete and more. We can also assist with the offloading of a truck or trailer, stacking of heavy items carefully together, or transportation of items to a scrapyard or other Southern California worksite. Call us today to reserve your high quality crane service. Selecting the right crane for your building project in San Diego is a key factor in controlling your costs. Talk with one of our crane experts to determine which of our cranes will best serve your needs. One of the most common requests we receive from the San Diego area is for assistance with the moving of a single large item for a residential customer. From HVAC units to Jacuzzis, Purple Crane has helped to move it all. 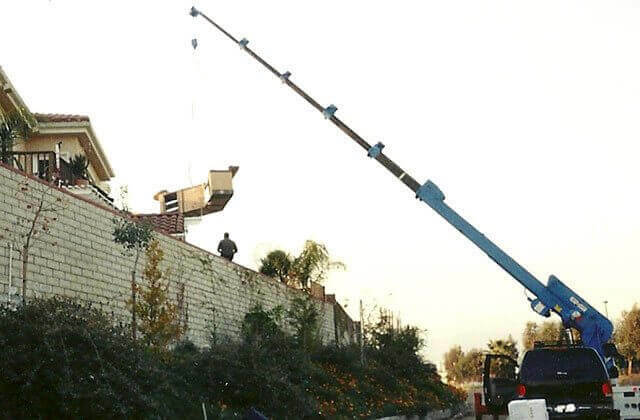 Our drivers can pick up and transport the item from a warehouse or storage facility, and have a crane waiting at the home in San Diego, ready to lift the object and place it in the backyard, rooftop, side yard, or other designated space. In our 30 years of experience, we have moved sculptures, septic tanks, barbecue islands, Jacuzzis, gazebos, swim spas, large appliances, and more, for apartment complexes, golf courses, hotels, parks, businesses, and country clubs. HVAC Contractors: Ask us about our free haul away service for old AC units. Purple Crane is the best choice for lifting any type of shipping containers in San Diego. We use heavy-duty trucks and trailers to safely relocate crates, railroad cars, and shipping containers to another part of your work site or anywhere in Southern California. 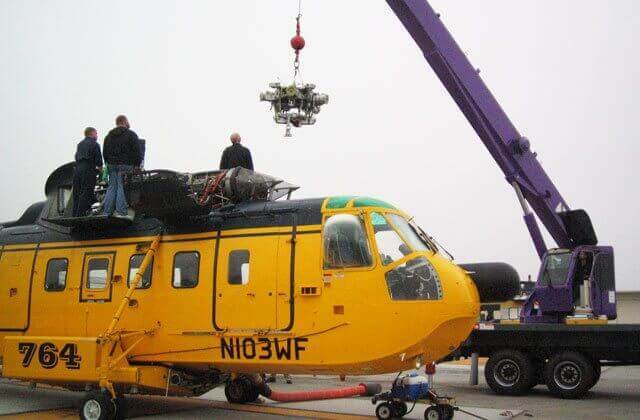 We can even arrange to have a crane ready to lift and place it at its final destination. Our professionals will ask you everything they need to know in order to accurately determine the best crane and/or trailer for your needs. 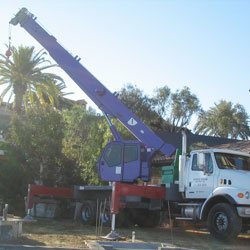 Purple Crane frequently performs expert crane lifts for those working with utilities in San Diego. Our crane operators are standing by with a fleet of cranes, trucks with trailers and man baskets ready to be dispatched out to your place of business or job in San Diego. We can help with removing transformers, dropping large pipes into place, lifting a water tank, and more. We've moved and lifted street lights, light poles, generators, and utility vaults. We also have man baskets that we can attach to one of our cranes or boom trucks. 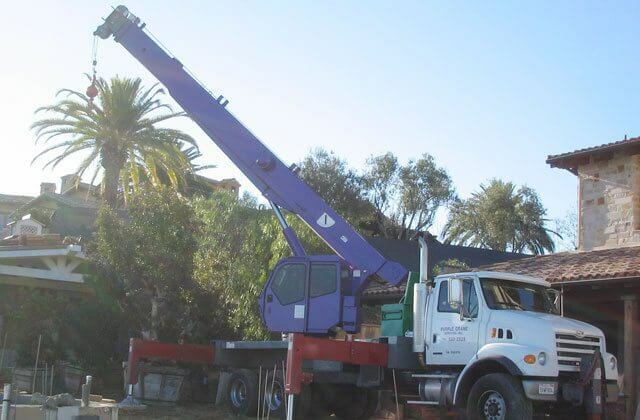 At Purple Crane, we often provide our reliable crane services to landscapers in San Diego. We have the expertise and experience to identify the best crane for your needs, so that you don't pay more than necessary. We can lift, transport and remove trees of any size using our cranes and trucks with trailers. Additionally, we can lift and move any large sized or heavy objects related to your landscaping project, such as fountains, boulders, rocks, statues, and more. 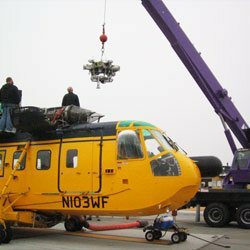 Why Use Purple Crane for All of Your Crane-Related Jobs in San Diego, CA? To learn more about our qualifications and what we can accomplish, give us a call. We accept credit cards, cash, and checks. We can also open credit accounts for those who qualify.